Lottery wins involving incredible sums of money have often been correctly described as “life changing.” The changes that huge jackpots bring are almost always positive at first, but after some time, not all winners see it as a blessing. But just as there are stories of sudden wealth improving lives, you can also find some stories of downward spirals to bankruptcy and even broken relationships. Generally speaking, most people who find it hard to cope with and manage sudden reversals in fortune come from the ranks of those who have lived simply most of their lives. But there are some notable exceptions, such as a man by the name of Delmer Hartwig. Delmer is from a little village called Killaloe, home to only 700 people. He is a fifty something bachelor who is described by his employer as reliable, and most people as a good man who always had a smile for everybody, as well as a contagious laugh. He loves fishing and hunting, usually in the company of friends. For 25 years he had operated a gravel truck for the G. Visneskie Logging Ltd., and lived a simple life. He is so simple that many people often see him in track pants and T-shirt. On special occasions, the track pants may be replaced by blue jeans. Like most people in the village, Delmer is also a lottery aficionado. All the people in the tiny village and in nearby towns became excited when the Ottawa Lottery declared that a $15 million jackpot for its September 13 draw had been won by someone in the area. Subsequent events revealed that the winning ticket had actually been sold D.J.’s Convenience, in Killaloe. Suddenly, there was a multi-millionaire in their midst. When Delmer Hartwig went back to the store to check on his tickets, the lottery terminal began to chime and the display screen showed a “Big Winner” message. A call to the lottery offices revealed the size of the jackpot: $15 million! The first thing Delmer did after the win was call up his boss to say he had won the lottery and wants to quit working. Then he made a seemingly strange decision to delay making his claims for the money so he does not have to miss elk hunting in the woods with some friends. 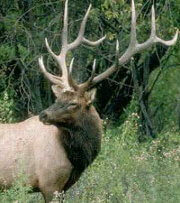 He reasoned out that the money can wait, but the limited elk season opens for just a short period each year. 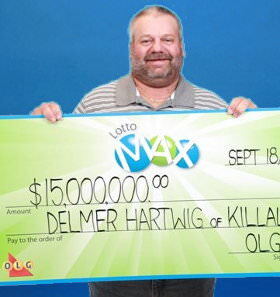 As soon as he came back from elk hunting on the 18th of September, Delmer finally claimed his prize at the OLG offices. While most people are advised to take some time to let the initial excitement wear off, to consult with solicitors , or avail of financial advice – the simple rural life Delmer still prefers clearly does not require such complex planning. And he’s right to say the money is safe with OLG, while the hunting season does have a short shelf life! I want to keep this simple. I want to share some money with family and friends, give some to charity and maybe buy a new car. I may splurge on an extreme hunting trip in the Northwest Territories or the Yukon. Great wisdom truly comes from the mouth of people who want to continue enjoying life and its simple pleasures despite possibly life altering – and sometimes damaging – effects of a huge windfall. In this case we can also say that this is one man who knows exactly what he wants! It couldn’t have happened to a better person. Here’s to you Delmer – enjoy it.